The last time I felt like this, it was seven years ago. I was almost nineteen years old and I was reinventing myself. Until I met her, I had not experienced life in this way. I boarded that airplane with her in September of 2004, and I came back renewed and reborn four months later. 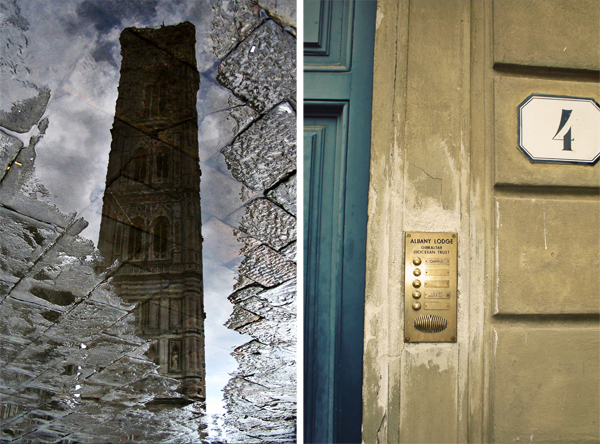 <><><><><> The campanile, a regular fixture on the walk to school and life in Florence, and Via Cherubini 4, our old front door. Me at Cinque Terre in Italy, September 2004, on the path to reinventing myself. I had always loved to create things. I always drew, painted, sewed, and molded things out of clay. I had just never considered myself to be a canvas before I met her. I had never realized how in control of my life and my dreams I could be. After I came back from Italy, I held onto that feeling of newness and power for a long time, but it eventually faded. It faded into what I began to perceive as reality. In this reality, I could dream, but there were larger goals at stake: I had to sing. I had to stay the course. My feelings of power over myself and my destiny faded into feelings of normalcy. I didn't feel as shimmering or as special. I was afraid. I was afraid of the mundane. I was afraid of unhappiness. I was afraid of solitude. It is so easy to let fear take control of your life. Not that anyone wants to be afraid, but giving in to fear and apprehension are much easier than standing up to it and taking control and molding your own destiny. I think the reason for this is that to stand up and take control of your life, it takes risk. You have to be willing to try something at which you might fail, or for which you might fall a few times before you rise up and succeed. I've been referring to my friend Elyse in this blog post. I think that Elyse, in a large part, made me who I am today. When I came back from Italy with her, I was changed forever. It wasn't just the experience and the knowledge that I had gained abroad. What I gained from Elyse as a friend was the ability to be the architect of my life. I don't think she ever used those words, but it is the power that she taught me. 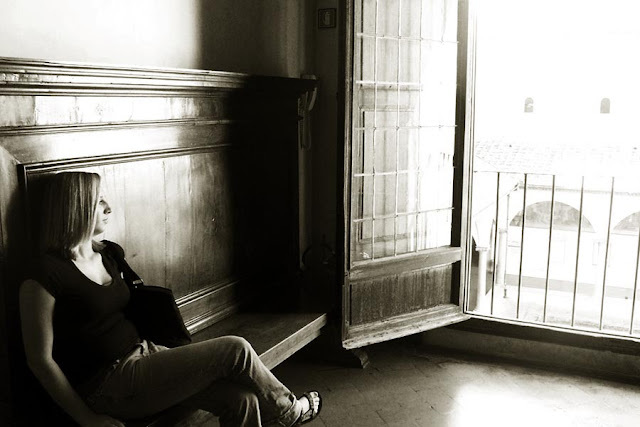 A portrait of Elyse that I took in San Marco in Florence, September 2004. When we were abroad or shortly thereafter, I seem to remember Elyse reading a book called By the River Piedra I Sat Down and Wept by Paolo Coelho. I know she loved it, and it has been on my reading list for the past seven years. This summer, I'm finally reading it. I read one of the first passages, and I have become sort of obsessed with it. 'You have to take risks, he said. We will only understand the miracle of life fully when we allow the unexpected to happen. Every day, God gives us the sun – and also one moment in which we have the ability to change everything that makes us unhappy. Every day, we try to pretend that we haven't perceived that moment, that it doesn't exist – that today is the same as yesterday and will be the same as tomorrow. But if people really pay attention to their everyday lives, they will discover that magic moment. It may arrive in the instant when we are doing something mundane, like putting our front-door key in the lock; it may lie hidden in the quiet that follows the lunch hour or in the thousand and one things that all seem the same to us. But that moment exists – a moment when all the power of the stars becomes a part of us and enables us to perform miracles. Joy is sometimes a blessing, but it is often a conquest. Our magic moment help us to change and sends us off in search of our dreams. Yes, we are going to suffer, we will have difficult times, and we will experience many disappointments – but all of this is transitory it leaves no permanent mark. And one day we will look back with pride and faith at the journey we have taken. Pitiful is the person who is afraid of taking risks. Perhaps this person will never be disappointed or disillusioned; perhaps she won't suffer the way people do when they have a dream to follow. But when that person looks back – and at some point everyone looks back – she will hear her heart saying, "What have you done with the miracles that God planted in your days? What have you done with the talents God bestowed on you? You buried yourself in a cave because you were fearful of losing those talents. So this is your heritage: the certainty that you wasted your life." -Paolo Coelho, By the River Piedra I Sat Down and Wept, pages 8-9. I find this passage remarkably inspiring. I want to live my life finding that magic moment and embracing it every day. Because life is too short to sit around waiting for miracles; God is in us, but we can't expect him to do all of the work for us. I'm going to photograph my first wedding as a professional photographer tomorrow. I am anxious, nervous, and excited! While it isn't the first wedding I've photographed, it feels like it could be. I equate this nervous feeling to the feeling I get the day before a big auditon or performance. I just have to remember that things that are big steps in life always make people feel anxious. There is a part of me that is scared of being a wedding photographer because there is so much pressure; and yet I know I'm prepared and organized and that the reward of photographing those moments goes far beyond any small fears. I have to accept the invitation each day, including tomorrow, that allows me to perform miracles. And the miracle tomorrow is to capture this beautiful day and an amazing love in a way that can be remembered forever. Elyse, I hope you are well. Even though we don't talk much, you continue to inspire me, and I know you always will. Love this! Love you! Please know that you are an inspiration to me! You're beautiful on the inside and outside and you make me want to strive to be the very best person I can be! Melissa! I love you too. And YOU are beautiful too - a strong, wonderful, gorgeous Mom, teacher, and wife! I miss my ISU friends so much all the time! I'm not sure where the future is going to take Ayron and I, but I spend every day wishing it was Iowa so I could see all of you more often.